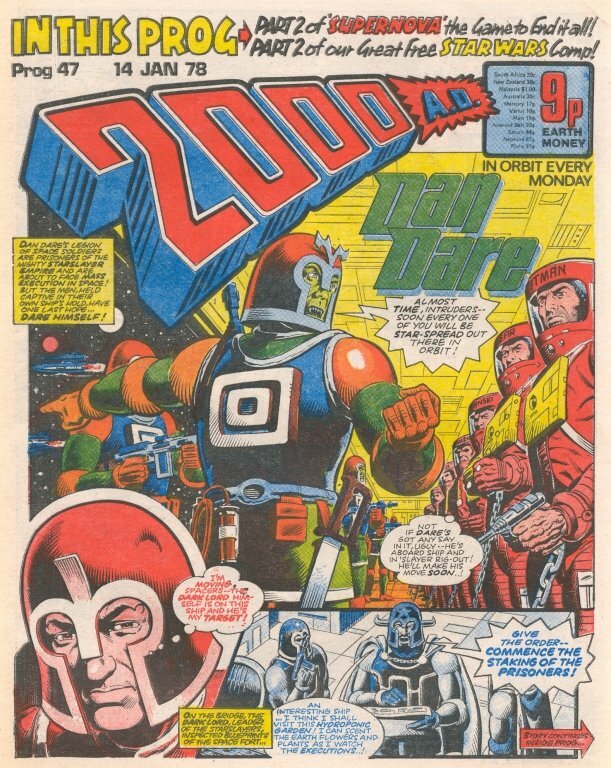 Now 2000 Ad is going through a period where the covers are the opening page of the Dan Dare strip. I like this. It seems like an attempt to create a seventies version of the Eagle Comic cover style from the fifties. Judge Dredd, the young upstart competition to Dare’s popularity, has been promoted to starting with the centre pages. Here, the strip’s opening two pages are in colour. The Visible Man makes it’s premier appearance, being the first writing credit to Pat Mills. I’m pretty sure that Mills was responsible for a substantial amount of the writing before the crediting began. I understand he was probably responsible for the entire first issue. I savoured reading prog 47, possibly due to a parcel of new comics expected later that day and bunch of graphic novels as presents for Christmas, I knew that I wouldn’t be reading prog 48 for a while. I was so caught up in the stories that I was reading that when the future Beatles made a cameo appearance in Invasion I had to remind myself that Gerry Finley-Day wasn’t suffering from senility by writing John Lennon as still being alive in 1999. I also received a package of 500 old style 2000 AD bags. I don’t imagine repeating this experiment ever again, but it would be pretty cool when refering to back progs for them to still be in pretty good shape, don't you think. At last, the series of “super covers” is over. They started out as good fun but eventually slipped into tedium only occasionally brightened up by Kevin O’Neill and Bret Ewins. Now we’re seeing illustrations on the front relating to stories from within. Admittedly, it might be shame that this Judge Dredd cover isn’t by this issue’s strip artist Mike McMahon but Kevin O’Neill makes a good second choice. O’Neill has started drawing a short, newspaper styled strip called Bonjo From Beyond the Stars or something. Because it’s Christmas, this issue’s runs to a full page. Wow! It’s fun but I would rather see him drawing straighter stories rather than goofy strips like this. The advantage of hind site means I can say, it seems to be an under utilisation of his talents. 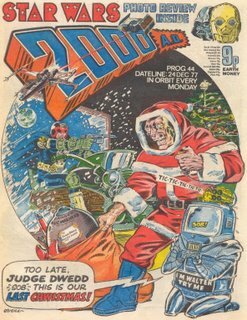 I guess that Judge Dredd is being established as 2000 AD’s favourite strip now given that it is the first of the ongoers to be given a cover spot since the Supercover series began. It’s also appropriate, I think, to read this prog at this time of year. Merry Christmas! I’m still attempting to fill in the gaps in my collection, specifically Annuals and Sci-fi specials. I’ve already passed the point in this experiment by which I should have read the first “summer special” and I’m now at the end of where I should have read the first Annual from 1978. Finally, there’s a photo feature on Star Wars in this prog. I guess the country is in the grip of Star Wars fever for the first time. 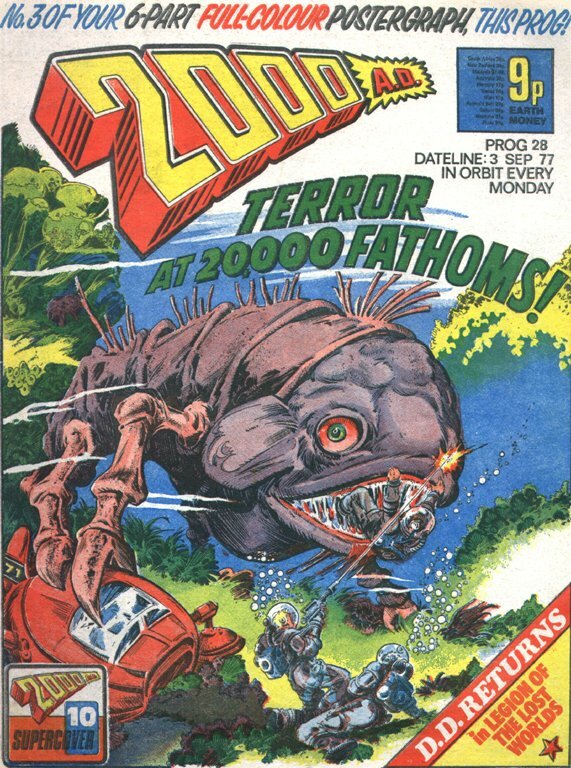 My memory of the beginnings of 2000 AD being a cash-in in the interest in science fiction triggered by the movie might be another that is wrong. Given that the comic has been running for nearly a year at this point and the weeks of preparation required before it had even begun means that I’m now thinking this must have been another trick of my Mike Baldwin like memory. No sooner do I mention that John Wagner is being credited as “John Wagner” as writer for Judge Dredd than his name gets changed to “John Howard”. I have no real idea why this happened for as long as it did. I had always presumed that Wagner preferred to keep his head down. During the eighties for example, when many other 2000 AD creator droids were willing to attend Comic Conventions and bask in the light of mainstream coolness, Wagner seemed to prefer to stay at home. Artist Brian Bolland’s first Judge Dredd strip appears in this issue. It’s the second part of the two part Death Race 5000. His style seems to sit somewhere between that which had been established by Mike McMahan and what he was going to help establish as the definitive way to draw the character, all scowl and chin. 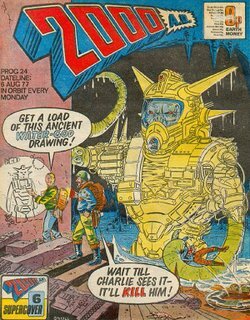 It’s certainly great to look at, especially as, in comparison with the rest of his work on Judge Dredd, has rarely been reprinted. The character Spikes Harvey Rotten makes his premier in this story. Unlike the blonde, grenade-as-earring-wearing punk that goes onto appear in The Cursed Earth story, this Rotten is drawn more as a Hell’s Angel. I prefer the later version. ITEM: Credit where credit is due. My recollection that all the creators were being credited for the work since prog 1 is wrong and only started a couple of issues ago. I had almost forgotten writers like Tom Tully and Alan Hebden. John Wagner is being credited as “John Wagner” instead of “John Howard” or “T.B. Grover” as he was for many years soon after. ITEM: The first art, as far as I can tell, by Brett Ewins and Brendan McCarthy graced a two-part Future Shock a prog or two ago. I say “two part” but I think it was a five-paged strip split into two parts because of space restrictions. It’s interesting to me that there seem to be a lot more ads (by which I mean genuine ads for other products, as opposed to space filling promotions for different comics published by IPC at the time) in these issues than there is today. Also, strips would often finish on the half page to accommodate an ad. There has even been a Dan Dare strip recently, the final page of which stopped for an oddly shaped ad for something or other. You wouldn’t get that these days. 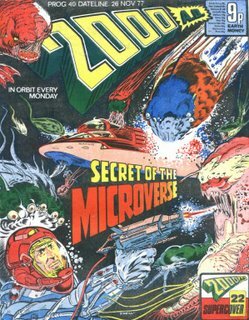 ITEM: It might have something to do with the accelerated rate at which I’m reading 2000 AD, but I’m getting a bit tired of this “super cover” series. I’m really looking forward to seeing covers by the interior artists relating to strips that they have drawn. The obvious exception is this cover by the always exceptional, Kevin O’Neill. ITEM: I’ve worked out that, at the rate that I’m reading these comics, it will be over a year after I started before I finish this project. It will slow down over Christmas too as I’m expecting a delivery of new comics this weekend (the reading of new titles always take priority over old ones) and a bunch of graphic novels from my Amazon wish list as presents for Christmas. I’ve been trying to remember how I would have known about the existence of 2000 AD to have bought the first issues when they were released. Although I occasionally dabbled in traditional British mainstream comics (for example, I definitely got the first two or three issues of 2000 AD’s predecessor, Action) the main comics I bought were published by Marvel UK. Almost accidentally, I found this TV advertisement for Prog 1 on You Tube. During the seventies, it wasn’t uncommon for new comics to be advertised on TV during a Saturday morning. I definitely saw this but the idea I had of it being quite lo-fi with an actor dressed up as Tharg in a jump suit and wearing a green, plastic mask was wrong. In fact, the animation probably seemed state of the art to me at the time. Other coverage I half remember I’m still in doubt about, however. I seem to remember some mainstream press stuff about 2000 AD mimicking the look of US comics by using fewer panels per page and hand lettering. 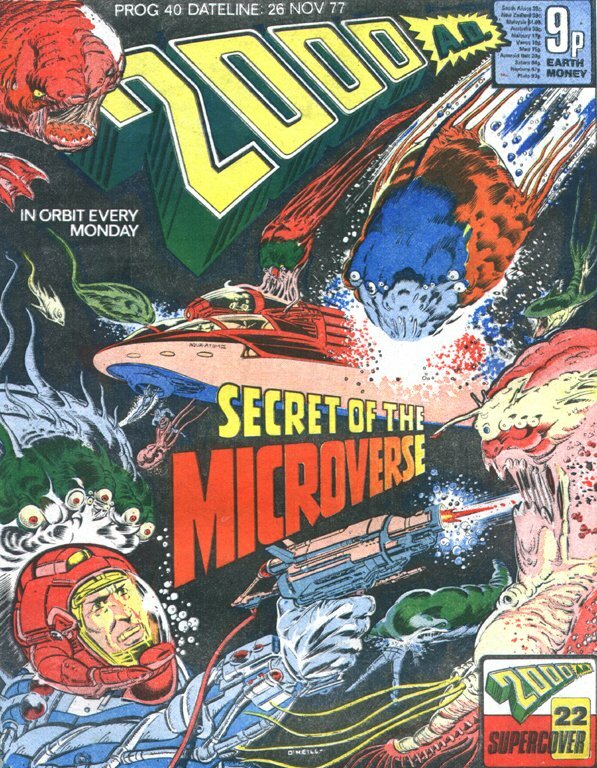 There was something on John Craven’s Newsround, focusing particularly on Dan Dare but this could easily be about the return of The Eagle during the eighties that I'm remembering. Man cannot live on old progs of 2000 AD alone so, over the weekend, I read my fortnightly delivery of new comics. Like in your diet, it’s important to maintain a healthy balance in your reading life too. Is it just me who thinks that Garth Ennis’ version of the Punisher and Billy Butcher from The Boys are like Bill Savage from the Invasion strip split down the middle? On one hand, The Punisher has Savage’s relentless brutality, while on the other; Butcher has his sadistic cockney wit. 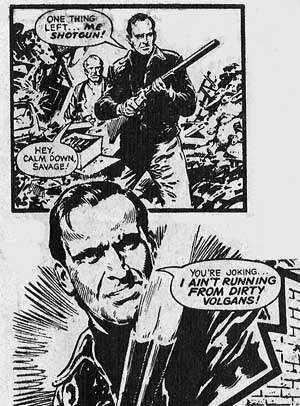 Last night, in prog 29, Savage shouts at a group of Dirty Volgans, “I like to start the day with a bang!” before blowing them up with a bomb. That just seems a bit innuendo heavy for a boys comic from the seventies, to me. Dan Dare returns this prog after a short break (a short break even by real time standards). This time it’s being drawn by Dave Gibbons who is the artist I associate most with the character, in 2000 AD at least. Interestingly, considering that he was the highest profile character in the comic at the time, he returns to little fanfare. The cover only references someone called “DD”, as if we’re supposed to have known who that was other than Daredevil. 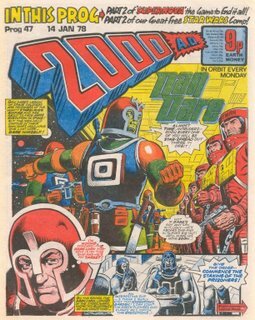 I’ve noticed that the only strip to have featured any creative credits at this time is Dan Dare and then only the artist is named. My recollection that the “creator droid cards” were there on all the strips from the start is obviously wrong. Gibbons seems to have been a fully formed and relatively prolific artist from the start of 2000 AD. Prior to Dare he drew the majority of Harlem Heroes. Apart from Watchmen and Green Lantern during the eighties, I can’t remember an occasion since that he’s come close to working at this pace. Unlike Belardinelli, whose previous Dare was exotic and the closest to feeling alien, Gibbons’ version is fresh, clean and looks more like the character that older readers would have remembered from The Eagle. I think, as well as recording my prog reading journey, it might also be fun to mention stories like the following here. 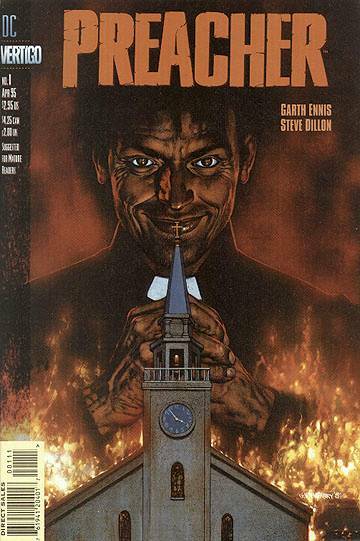 Garth Ennis and Steve Dillon’s Preacher series, originally published by DC Comics’ imprint Vertigo, is to be made into a TV series by HBO. Given that Ennis and Dillon made their names in the weekly or in one of its spin off publications then it's appropriate that I should make a record of it in this blog, don't you think? I was interested to read in Paul Gravett’s book Great British Comics, that when Kevin O’Neill started working in the comics industry during the sixties one of his first jobs, apparently, was to white out all the artists’ signatures on the artwork. Hey, it’s a living! 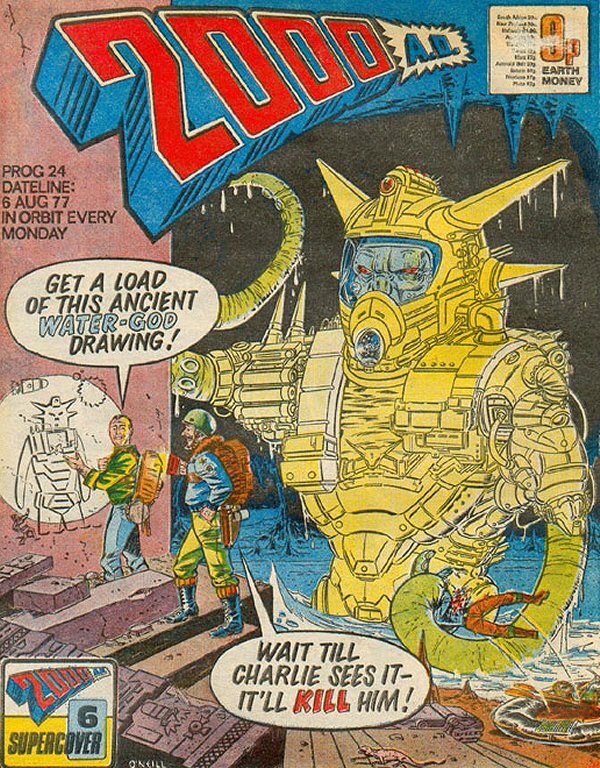 It was a surprise to me because I always assumed that his career started with 2000 AD during the seventies. Anyway, this issue, features the first Future Shock, or the prelude to the first Future Shock. A three paged strip drawn by O’Neill (who, incidentally, draws the cover). Some kid breaks into the Nerve Centre shouting how he hates 2000 AD and it not being as good as the titles published by Wonderful Comics. Tharg puts him straight but not before we learn that Wonderful Comics is a thinly disguised version of Marvel. This strip says to me so much about where the comic was coming from at the time. 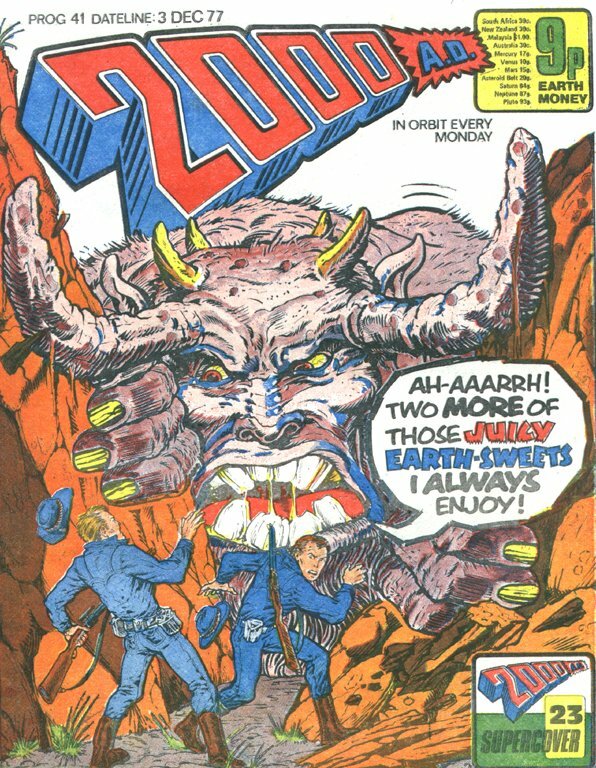 When all the new punk bands were mouthing off about groups like The Rolling Stones being rock dinosaurs, 2000 AD was doing a similar thing about other publishers, albeit in a way that was slightly self deprecating.